In a mad, desperate, last-ditch effort to use up all of our perishables before we head out to the great outdoors for a week, I went and bought a bunch of fruit. What? I also happened to find a couple of bags of lemons in my hand as I handed over my hard-earned cash. To quote the cute poster of a kitty-cat that hung in the nurse's office of my elementary school, "When life hands you lemons, make lemonade!" (What a kitty has to do with lemonade is beyond me as much today as it was back in second grade while I lay there waiting for my mother to come pick up my pukey self). Regardless of kitties and posters and second grade, I am feeling quite well these days and thusly interested in enjoying myself. Plus, life (by which I mean my own consumerism) gave me lemons. And strawberries. First, rinse, and hull the strawberries. Place them in a blender with about a half cup of water and blend until pureed. 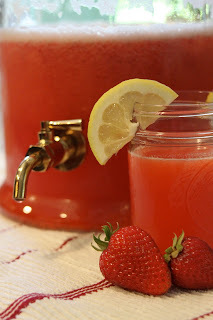 Mix the lemon juice, strawberry puree, sugar and water in a large pitcher with ice. Taste and add more water as desired. If you choose, you can add a shot of vodka to each serving (or if this is going to be an adults-only treat, add a cup of vodka to the pitcher). It makes a lovely way to relax after a long day of relaxing at the beach. This post is linked to Cast Party Wednesday.